Generally biblical names are chosen by parents for their newborns. The baptism ceremony is observed as per the Christian norms. But the naming ceremony varies depending on the region of birth in India. For example in Kerala, the Hindu custom of tying the aranjanam – a girdle like ornament tied around the waist of infants – is followed in Christian families too. Also, Christian names are attached either as prefix or suffix to a Hindu name or native place for children in Malayalee families. 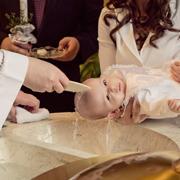 While baptism by a priest is common across the country, there may be differences in other rituals as social backgrounds and regional practices are factors that impact the naming ceremony to a great degree. Also, there are many denominations in Christianity – Roman Catholic, Protestant, Pentecost and CSI – which have sizeable following across the country. In all these denominations, the local church is patronised by the families who attach importance to the suggestions by priest on naming their newborn. While Christian families take utmost care in selecting the right, easy to pronounce names, sometimes they may get confused given the bewildering choice and they get lost as they don't know where to start from. Names of heroic characters from Bible, Old and New Testaments are chosen by Christian families for their newborn. Also, the name should not be either too difficult to pronounce or quaint as people from different communities must be able to familiarise with it easily. Some Christian families always use Hindu names despite following a different faith as they could not completely sever their links from the past life before getting converted. A Roman Catholic’s name differs from that of Protestant and each and every denomination has a set of names that bears linkages to their unique origin in India.